Convertible loan agreements involve a multitude of terms, which facilitate their execution. However, these terms make convertible notes complex documents to deal with. We discussed in several articles the main terms and practices associated with convertible notes. In our experience with convertible debt, we discovered there is no unified template that complies with European securities legislation by providing for detailed disclosure information rights of the lenders. This is why we decided to share ours with the entrepreneurial community. Often times, convertible loan agreements are favorable to one of the parties involved – lender-friendly or borrower-friendly. We have worked on the template in an attempt to balance the interests of both sides. 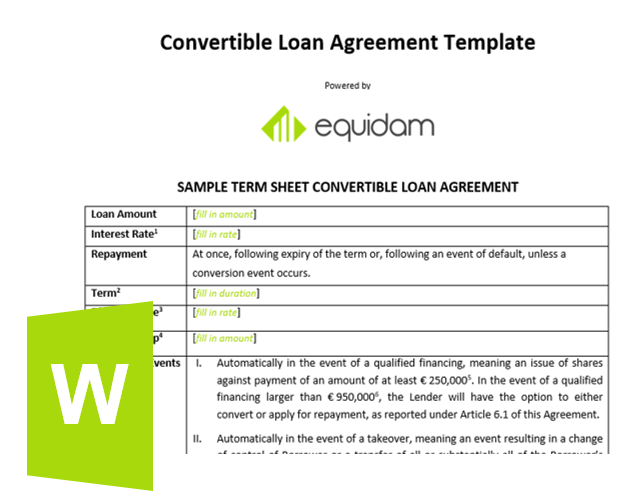 Standard terms for a convertible loan agreement. The template does NOT include country specific provisions which must be inserted in a convertible loan agreement under the country’s securities laws. We advise you to make sure you get acquainted with your national specific provisions before preparing your convertible loan agreement. Disclaimer: This document serves just as a starting point for entrepreneurs willing to raise convertible debt. It is not a legal document and should not be used without having obtained a consultation from a qualified legal professional. Check out our Convertible Note Tool to calculate the conversion percentage of your convertible note!